Casa Clara Bella encompasses traditional Mexican architecture with outdoor/indoor living with all the modern conveniences of our world today. 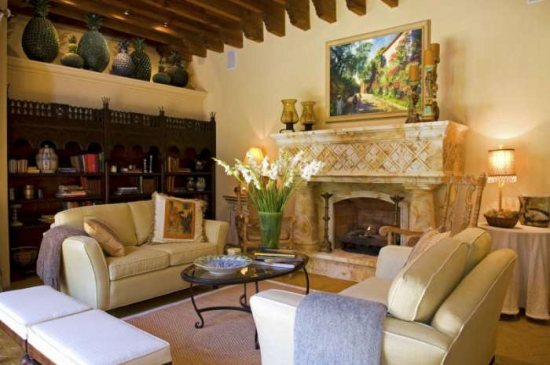 You get the best of both worlds in this exquisite 3 bedroom 4 1/2 bath house off the Parque Juarez. When you open the door to Casa Clara Bella, you enter the outdoor sala that looks out onto the garden area. There is a comfortable sitting area with a fireplace. Off this area is a bedroom, where there is a King size bed, flatscreen TV, fireplace and en suite bathroom. Also note - that there are down comforters and high quality linens on all the beds. 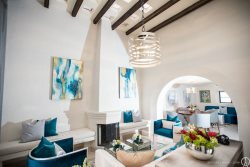 As you wind around the terrace you will find another formal sitting area with a beautiful cantera fireplace. The kitchen has high end appliances that any cook would be inspired by. The formal dining room is in it's on room that looks out onto the garden, as well. All the rooms in the house open to this courtyard. Upstairs you will find another outdoor terrace with two more bedrooms, and a small den/office area. One of the bedrooms has 2 matrimonial beds with bathroom. The master bedroom is also on the second floor. It has a king size bed, with large bathroom - where there is a jacuzzi tub and separate shower, as well as a vanity area. The rooftop terrace gives you some of the most spectacular views of San Miguel! This house has everything that you could need. Every detail every convenience! There is a Vonage phone and Wifi internet. There is also satelite TV, purified water throughout the house, a stand-by generator (you will never be without power). Tips for the house are $30 USD per bedroom.